SPEC has determined that this result was not in compliance with the SPECjAppServer2004 run and reporting rules. Specifically, this result used a configuration which SPEC has determined is not in compliance with section 2.10.1 of the benchmark run rules and hence violates SPECjAppServer2004's atomicity requirements. Disable security manager by remove reference to the server.policy file. durability for the XA transaction logs, message queues, and message logs. This extrapolates to 4.18 GB of storage for an 24 hour run. The database is configured with 876 GB of storage. Sun Java System Application Server 8.1 uses pass-by-value semantics by default. on one of the application servers. to the EJB tier using RMI/IIOP. 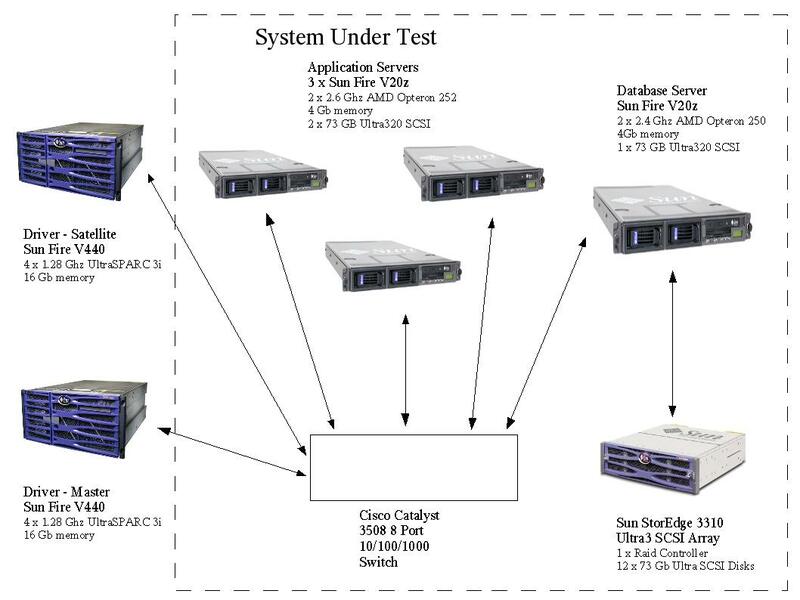 the database server and JMS server. The Cisco Catalyst 3508 switch used default settings.